The Earthbag or Superadobe building method basically entails long bags of dirt from the building site laid in layers, forming arched structures for strength, so that the stacks serve as both the walls and roof of the structure. The wetted earth can either be compacted by pounding (rammed earth) to make it hard, or ~10% cement can be added with ~10% water so that the mixture hardens, with the bag providing the form. Cal-Earth sells 1-mile long lengths of both 22- and 18-inch wide bagging for a few thousand dollars. The bagging is cut to length, and then sewn shut with twine. A good analogy of this construction method is the clay pot one might build in elementary school using rolls of clay, shaping it into a beehive type configuration, though there are a lot of other shapes that can be sturdy. The Superadobe technology (sandbag tubes and barbed wire) was designed and developed by architect Nader Khalili and Cal-Earth Institute , and engineered by P.J. Vittore. According to Cal-Earth, "Superadobe is a patented system (U.S. patent # 5,934,027 ) freely put at the service of humanity and the environment." With the thick thermal mass walls (22-inches of earth), they help reduce heating and cooling bills. Also, their arch-based shape makes them very strong, exceeding the strength of most other structure types, making them ideal for seismic-prone areas, while also being more affordable (~$60/sq ft ) than most building types. Also the strength contributes to longevity. As the different rows are added to each other, they "become as one complete piece." Proponents say these buildings could last 500 to 1000 years. "They're monuments." The early models were run through third party testing by an engineering firm who placed 60,000 pounds of lateral pressure on top and did not detect a single failure. 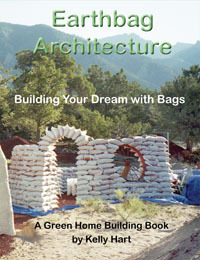 As of 2007, there were around 3,000 Earth Bag homes built around the world, ranging from Siberia to Costa Rica. Permits have been issued in U.S. states including: AZ, HI, CA, UT, NV, WA, KY; as well as in BC in Canada. Unless the code requires otherwise, the first row of bags can be placed right on the ground, without a footer.